The White House Ornament Collection presents The Official 2006 White House "Air Force One" Ornament. Air Force One is the air traffic control call sign of any U.S. Air Force aircraft carrying the President of the United States. Since 1990, the presidential fleet has consisted of two specifically configured, highly customized Boeing 747-200B series aircraft�tail numbers 28000 and 29000�with Air Force designation VC-25A. While these planes are only referred to as "Air Force One" while the president is on board, the term is commonly used to describe either of the two aircraft normally used and maintained by the U.S. Air Force solely for the president. The VC-25A is capable of flying 12 600 km (7,800 miles)�roughly one-third the distance around the world�without refueling and can accommodate more than 70 passengers. Before these planes entered service, two Boeing 707-320B-type aircraft�tail numbers 26000 and 27000�had operated as Air Force One starting in 1962. The Air Force designation for these aircraft was VC-137. Since its inception, Air Force One has become a symbol of presidential power and prestige. 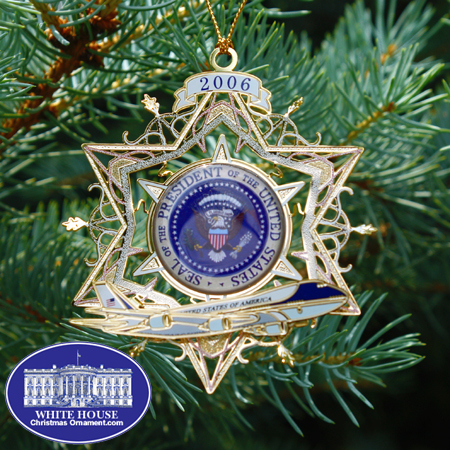 The 2006 White House Christmas Ornament portrays Air Force One flying under the Presidential Seal. An American bald eagle holds a ribbon in its beak; the ribbon has the motto of the USA, "E PLURIBUS UNUM," meaning "Out of many, one." The eagle is clutching an olive branch (with 13 olives and 13 leaves) in one foot (symbolizing peace) and 13 arrows in the other (the 13 stands for the original 13 colonies and the arrows symbolize the acceptance of the need to go to war to protect the country). A shield is in front of the eagle; the shield has 13 red and white stripes (representing the original 13 colonies) with a blue bar above it (it symbolizes the uniting of the 13 colonies and represents congress). Above the eagle are 13 white clouds, 13 white stars, and many tiny stars. 50 white stars surround the eagle in a circle (on a deep blue field). The words, "Seal of the President of the United States" surround the seal (on a tan field). The gold-plated star surrounds this majestic ornament originate from the hand-painted murals in the White House entrance hall.